Why Peter Tymms’ grasp of the fundamentals of measurement in psychology/education disqualifies him from any role in determining the future of transfer testing in Northern Ireland. Professor Peter Tymms is a long-time proponent of the central role that latent variables play in modern psychometrics. The Item Response model advanced by Georg Rasch has an important place in his research. I will argue in what follows that those who advance Item Response Theory approaches in general, and Rasch modelling in particular, have failed to understand the true complexity of the central predicate “ability.” Wittgenstein stressed that ability is something potential, a capacity rather than a state. Individuals are carriers of potentiality and not states. Psychology is concerned interactions and not the intrinsic properties of the relata involved; relations have definite properties while the relata themselves are indefinite. Peter Tymms has failed to appreciate the indeterminacy of the mental. Measurement in psychology/education is never a process of “checking up” on what is already in the mind/brain of the individual. Rather, unlike measurement in Newtonian physics, the act of measuring transforms a potentiality to a definite state. Measurement in psychology and education should not be concerned with what ability is, but must settle for what can be said about ability. Michell is right to claim that psychometrics is “pathological science,” and that measurement in psychology is “at best speculation and, at worst, a pretence at science.” Trendler’s (2011) claim that measurement theorists should abandon all attempts to repair psychometrics is surely justified. All proponents of Item Response Theory, including Professor Tymms, subscribe to the “reflective model” in which variation in the latent variables is viewed as prior to variation in the manifest variables. Alas, the reverse is true. Item Response Theory omits entirely the human practices (reading, arithmetic, and so on) into which the child is enculturated by teachers and parents. This is the all-important “environment” in which the child participates, an environment which Item Response Theory is powerless to represent. Item Response Theorists posit “abilities” hidden in the mind/brain which are the source of the child’s test responses. However, the Nobel laureate Herbert Simon dismissed such reasoning: “Human rational behaviour is shaped by a scissors whose blades are the structure of task environments and the computational capabilities of the actor.” The scissor metaphor is a reference to Alfred Marshall’s puzzlement over which scissor blade actually cuts a piece of cloth – the top blade or the bottom. The lesson for psychometrics is that omitting the environment of academic practices in which the child participates will produce nonsense. One can find the source of Item Response Theory’s difficulty in Niels Bohr’s 1949 paper entitled Discussion with Einstein on Epistemological Problems in Atomic Physics. Few scientists have made a greater contribution to the study of measurement than the Nobel laureate and founding father of quantum theory, Niels Bohr. Given Bohr’s preoccupation what the scientist can say about aspects of reality which are not visible (electrons, photons, and so on), one can understand his constant references to measurement in psychology; “ability” cannot be seen directly, rather, like the microentities that manifest as tracks in particle accelerators, ability manifests in the individual’s responses to test items. Assessment is concerned with “measuring” something which the measurer cannot experience directly, namely, the ability of the examinee. Item Response Theory relies on a simple inner/outer picture for its models to function. The inner (a realm of timeless, unobserved latent variables, or abilities) is treated as independent of the outer (here examinees write or speak responses at moments in time). This is often referred to as a “reservoir” model in which timeless (hidden) abilities are treated as the source of the individual’s (public) responses given at specific moments in time. As early as 1929 Bohr rejected this simplistic thinking in strikingly general terms: “Strictly speaking, the conscious analysis of any concept stands in a relation of exclusion to its immediate application. The necessity of taking recourse to a complementary … mode of description is perhaps most familiar to us from psychological problems.” Now what did Bohr mean by these words? Consider, for example, the concept “quadratic.” It is tempting to adopt a reservoir approach and trace a pupil’s ability to apply that concept in accord with established mathematical practice to his or her having the formula in mind. The guidance offered by the formula in mind (Bohr’s reference to “conscious analysis”) accounts for the successful “application,” for example, to the solution of specific items on an algebra test. However, this temptingly simplistic model in which the formula is in the unobserved mental realm and written or spoken applications of the concept “quadratic” take place in the observed public realm, contains a fundamental flaw; the two realms cannot be meaningfully linked up. The “inner” formula (in one realm) gets its guidance properties from human practices (in the other realm). A formula as a thing-in-itself cannot guide; one has to be trained in the established practice of using the formula before it has guidance properties. In school mathematics examinations around the world, pupils are routinely issued with a page of formulae relevant to the examination. Alas, it is the experience of mathematics teachers everywhere that simply having access to the formula as a thing-in-itself offers little or no guidance to the inadequately trained pupil. The formula located in one realm cannot connect with the applications in the other. Wittgenstein teaches that no formula, rule, principle, etc. in itself can ever determine a course of action. The timeless mathematical formula in isolation cannot generate all the complexities of a practice (something which evolves in time); rather, as Michael Oakeshott puts it, a formula is a mere “abridgement” of the practice – the practice is primary, with the formula, rule, precept etc. deriving its “life” from the practice. Returning to Bohr’s writing, it is instructive to explain his use of the word “complementarity” in respect of psychology and to interpret the meaning of the words: “stands in a relation of exclusion.” Complementarity is the most important concept Bohr bequeathed to physics. It involves a combination of two mutually exclusive facets. In order to see its relevance to the validity of IRT modelling, let’s return to the two distinct realms. We think of the answers to a quadratic equation (of course, a typical school-level quadratic equation has two distinct answers) as being right or wrong. In the realm of application this is indeed the case; when the examinee is measured, his or her response is pronounced right or wrong dependent upon its relation to established mathematical practice. However, in the unobserved realm, populated by rules, formulae and precepts (as things-in-themselves), any answer to a quadratic equation is simultaneously right and wrong! A formula as a thing-in-itself cannot separate what accords with it from what conflicts with it, because there will always exist an interpretation of the formula for which a particular answer is correct, and another interpretation for which the same answer can be shown to conflict with the formula. Divorced from human practices, the distinction between right and wrong collapses. (This is a direct consequence of Wittgenstein celebrated “private language” argument.) This explains Bohr’s reference to a “relation of exclusion.” In simplistic terms, the unobserved realm, in which answers are compared with the formula for solving quadratics, responses are right-and-wrong, while in the observed realm, where answers are compared with the established practice, responses are right-or-wrong. Measurement of ability is not a matter of passively checking up on what already exists – a central tenet of Item Response Theory. Bohr teaches that the measurer effects a radical change from indefinite to definite. Pace Item Response Theory, measurers, in effect, participate in what is measured. No item response model can accommodate the “jump” from indefinite to definite occasioned by the measurement process. All IRT models mistakenly treat unmeasured ability as identical to measured ability. What scientific evidence could possibly be adduced in support of that claim? No Item Response model can represent ability’s two facets because all such models report ability as a single real number, construed as an intrinsic property of the measured individual. Finally, in order to highlight the incoherence of the type of measurement model advocated by Peter Tymms, it is instructive to consider a thought experiment in which a primary school child responds to the addition problem: “68 + 57 = ?” In the appendix below the erroneous thinking of the psychometrician is adopted in that the child’s ability is considered to be a mental state which is the source of his or her response. It is demonstrated that all of the facts about the child (his or her complete history of responses to addition problems and complete information about the contents of his or her mind) are in keeping with the answer “68 + 57 = 125.” Unfortunately, all of the facts are also in keeping with the answer “68 + 57 = p” where p is ANY number; someone with complete information has to conclude that the child is right and wrong at the same time. Consider the simplest of measurement situations encountered in psychology and education. How can one establish if a student in the early years of formal schooling understands how to use the “+” sign? The student whose grasp of the “+” sign is being measured has been taught to add, but has not yet encountered the problem “68 + 57 = ?” This problem has been selected at random but the argument generalises to any rule-governed activity (Kripke, 1982). The measurement situation is broken into two phases: the phase immediately before the student answers and the phase during which the answer is spoken or written. This offers two perspectives on the student’s understanding of the “+” sign. The idea that understanding how to use the “+” sign is an “inner” mental state, activity or process has enormous appeal. The temptation to reason that the student’s first-person perspective on his or her understanding is superior to the measurer’s third-person perspective is almost irresistible, since the measurer has to settle for mere behaviour. It is difficult to escape the impression that the student has privileged access to his or her grasp of the meaning of “+,” because to mean is surely to have something in mind? (Putnam, 1988). On the other hand, the measurer must settle for the mere manifestations of that understanding. The student seems to have first-person direct access to the thing-in-itself, namely, his or her understanding of “+” while the third-person perspective is associated with indirect access. The third-person perspective involves observation of the student exercising his or her understanding rather than the understanding itself; it would seem that the student alone can “observe” understanding because it is a mental process. This enticing simple Cartesian picture of the “inner world” is clearly compelling. This idealised measurement situation will be used to argue that, before the student answers the problem “68 + 57 = ?” (immediately prior to measurement) the totality of facts about the student are in keeping with the student intending to give the right answer and with the intention to give one of an indefinite number of wrong answers. It is established that the state “understands the ‘+’ sign” and the state “doesn’t understand the ‘+’ sign” both can be simultaneously ascribed to the unmeasured student. In short, it is meaningless to assign a definite grasp of the “+” sign to an unmeasured individual. In quantum theory, unmeasured quantum entities are characterised by superpositions which are portrayed as being “here” and “there” simultaneously. For unmeasured quantum entities, the notion of a definite location is unintelligible. However, when the quantum entity is measured it assumes a definite position and is characterized as either here or there. Consider the measurement of an individual’s ability to respond to the addition problem: “68 + 57 = ?” The case will be made that when the psychologist focuses on the unmeasured ability of the individual, all the facts about that individual can be shown to be in keeping with the individual being both “right” and “wrong” (with respect to the addition problem) at the same time. It will be demonstrated that, immediately prior to the act of measurement, an individual’s understanding of the “+” sign is entirely indeterminate, with the categories “right” and “wrong” being applicable simultaneously. It will be argued that someone with complete information about the student’s past achievements in addition, together with complete information about his or her mental states, would find it impossible to use this information to predict the student’s answer to any simple addition problem in an infinity of cases. It will be demonstrated below that before a measurement is made – for example, before a student says or writes the answer to the question “68 + 57 = ?” – at that moment, all of the known facts about the student are in keeping with the correct answer “125” and an incorrect answer – “5,” – for example. A rule as a thing-in-itself can never determine an action. The student’s mathematical ability with respect to the question “68 + 57 = ?” is completely indeterminate prior to the statement of the answer. “68 + 57 = ?” immediately before he or she responds, at the instant of responding the student is deemed correct if the answer is 125, and incorrect if the student answers 5. Immediately before answering the student is right and wrong. The moment the answer is articulated the student is right or wrong. In short, measurement isn’t a matter of checking up an existing attribute (as in Newtonian physics); measurement effects radical change. Having set the scene for what is to come, the case will now be made that it is meaningless to ascribe a definite ability to an unmeasured individual; the ascription of a definite ability is only meaningful in a measurement context. The idea that psychological measurement owes more to quantum measurement principles than to Newtonian mechanics depends on this case being made. This is achieved by calling on Wittgenstein’s later philosophy and the remainder of this section is given over entirely to this single task. Wittgenstein’s writings on first-person ascription of ability are essential to developing a measurement model with the individual at its core. generates 2, 4, 6, 8, -62, … . to generate all five terms. This (albeit highly unusual) student could rightly claim to be “going on in the same way” when he or she wrote down -62 as the fifth term. The student’s claim that he or she was simply continuing the rule exhibited by the first four terms is completely defensible since there are an infinite number of rules which begin ‘2, 4, 6, 8’ but diverge on the next term and all terms thereafter. It can be claimed that the student did continue in the same way but the student’s way was at odds with the teacher’s intention when the teacher instructed the student to “go on in the same way.” Unfortunately, “Finite behaviour cannot constrain its interpretation to within uniqueness” (Wright, 2001, p. 98), so what makes the student’s continuation wrong and the teacher’s right? Wittgenstein’s writings on rule-following do not, for a moment, imagine that real children in real classrooms extend this series of four even numbers as “2, 4, 6, 8, 1090, …” or “2, 4, 6, 8, -62,” for example. Consider the case of simple addition of two natural numbers. Almost everyone who has been to school for a few years is confident that they have understood the meaning of the sign “+.” They feel sure they understand how to use the rule for the “+” sign. This confidence exists despite the fact that no individual has carried out the infinitely long list of computations associated with the “+” sign. Given that individuals live for only a finite number of years and there are an infinite number of natural numbers x and y for which x + y can be computed, it follows that for any individual it will always be possible to identify values of x and y for which they have not yet computed x + y. The student in the early-years of primary school, and just coming to terms with addition, may have computed x + y for all values of x and y less than 57, for example, so that the computation “68 + 57”, say, is not part of the student’s short computational history. The calculation “68 + 57” would be a novel computation for this student. The point to be emphasised is that for every individual it will always be possible to identify an addition problem that this individual has not previously encountered. This sceptic questions my certainty about my answer … Perhaps, he suggests, as I used the term ‘plus’ in the past, the answer I intended for ’68 + 57’ should have been ‘5’! Of course the sceptic’s suggestion is obviously insane. My initial response to such a suggestion might be that the challenger should go back to school and learn to add. Who is to say that this is not the function I previously meant by ‘+’? The individual’s difficulty in seeing off the sceptic is that all of his or her past computations are for values of x and y less than 57 and for these values ‘+’ and ‘Å’ yield identical values. It is only for values of x and y greater than or equal to 57 that differences occur. It is only for numbers greater than or equal to 57 that addition and quaddition (someone using the quus function is said to be engaged in quaddition) give different results. Kripke (1982) points out that the facts of interest to the sceptic are to be found in two distinct realms: the “outer” realm of past computations, and the “inner” realm of the mind. If all the facts from the student’s history of past computations are consistent with the function ‘plus’ and with the function ‘quus,’ then maybe an examination of the student’s mental history (facts about the contents of the student’s mind) will decide whether he or she should answer “125” or “5” in order to be consistent with his or her past history of computation. Kripke (1982) permits the individual responding to the sceptic’s challenge to have unlimited and infallible access to past computations (outer) and past mental states and processes (inner). Kripke (1982) frequently makes reference to what an omnipotent, omniscient, all-seeing God – who has access to every aspect of the individual’s computational history and to his or her thought processes – would see if He were to look into the student’s mind. Kripke (1982) argues that all of the facts about the student – all the (outer) facts about the student’s computational history and all the (inner) facts about the student’s mental states and processes – are consistent both with that individual understanding the orthodox addition function and the contrived “quus” function by “+” sign. The temptation, of course, is to accept that while any finite series of computations can be made to accord with both ‘plus’ and ‘quus’ functions, an examination of the individual’s mind would turn up a fact or facts that would discriminate between the functions. It is instructive to illustrate how the sceptic refutes such arguments. But what makes the individual’s understanding with respect to the ‘+’ sign, a grasp of adding rather than quadding? Consider an individual who attaches the aberrant interpretation (quus) to his or her past computations. If the student’s understanding of the “+” sign contracts him or her to use it according to the quaddition rule then the individual should reply “5” when asked to compute “68 + 57.” In this case, to reply “125” is to fail to go on in the same way. But what fact about the student’s understanding could be produced to convince the sceptic that he or she is contracted to follow the quaddition rule rather than the addition rule? What fact about a student’s past grasp of the ‘+’ sign makes his or her present response of “5,” for example, right or wrong. The finite number of additions the individual has completed to date – all involving arguments less than 57 – are consistent with understanding the ‘+’ sign in terms of the addition function and the quaddition function. The common-sense view that understanding is a process or activity which happens in the mind has enormous appeal. The notion that to understand is to have something in mind and that this understanding somehow fixes future behaviour in respect of how that understanding is exercised seems beyond challenge. At the same time, it also seems obvious that the future behaviour referred to is somehow inferior to understanding as a thing-in-itself; understanding is the real thing, whereas behaviour is merely a particular manifestation of that understanding. Understanding is construed as “inner” while behaviour is construed as outer. Few dispute the thesis that while the individual somehow has direct access to his or her understanding, the person measuring that understanding, for example, has to settle for indirect access in the form of the individual’s behaviour. First-person access to understanding seems superior to mere third-person access. Furthermore, the inner and outer seem to be entirely independent realms; after all, someone who has understood addition has the clear sense that he or she will provide the correct answer to the question “2 + 2 = ?” in advance of writing or saying their answer. This person doesn’t have to wait until they’ve responded in order to confirm their understanding to themselves. Understanding (viewed as a property of the inner), in this instance, at least, seems quite independent of the subsequent behaviour in which that understanding is exercised. Kripke (1982) considers the case of having a formula in mind which can be introspected. Could this provide the elusive fact that distinguishes the individual’s understanding of “+” as a grasp of the addition function rather than a grasp of the quaddition function? Could this be the “inner fact” that determines “125” as the answer the student should give to “68 + 57 = ?” in order to keep faith with the student’s understanding of “+”? This is an attractive option because one can conceive of a formula as something finite but which nevertheless has the capability of generating an infinity of responses. If God were to look into the individual’s mind and spotted, say, the quus function defined above, He could predict with certainty that the individual is contracted to reply “5” to the question “68 + 57 = ?” in order to keep faith with his or her understanding. One can also appreciate the popular appeal of this approach for one does feel that in solving quadratic equations, for example, one “calls to mind” the quadratic formula. One can almost “see” the formula in one’s mind’s eye when solving quadratic equations. The case against the notion of a formula as the sought-after fact which distinguishes adding from quadding will now be set out. Alas, having a formula in mind will not satisfy the sceptic because a mental representation of the formula in itself cannot determine the individual’s response to any given problem. A student who has not been instructed in the solution of quadratic equations but who has merely memorised the formula for solving quadratic equations will not be able to use it to solve algebraic problems involving quadratic equations. Merely having the formula in mind is not enough to determine use. The student must be trained in the use of the formula; simply having access to the formula in itself – whether in mind or on paper – doesn’t fix the response the student makes when presented with a problem requiring the use of the quadratic formula. It is the practice in school mathematics examinations around the world to issue a booklet of formulae to examinees. It is the near universal experience of mathematics teachers that students with inadequate training in the solution of quadratic equations may derive little value from having access to the relevant formula booklet. This is because the formulae in themselves don’t fix behaviour. If the formula in isolation fixed the student’s response, then every student issued with a formula booklet in a mathematics test would answer the quadratic question correctly. To underline the limitations of having formulae in mind, Wittgenstein explores the circumstances under which sign-posts offer guidance. Wittgenstein (1953, §85) states that in the Cartesian picture “A rule stands there like a sign-post.” In this statement he is asking the reader to reflect on the property of a wooden sign-post which enables it to serve as a guide to behaviour. Considered in itself a sign-post is just a board or something similar, perhaps bearing an inscription, on a post. Something so described does not, as such, sort behaviour into correct and incorrect – behaviour that counts as following the sign-post and behaviour that does not” (McDowell, 1992, p. 41). One is forced to conclude that, despite having all the facts (inner and outer) about the student, these alone can’t determine in advance that his or her response will be “125” or “5.” Causality has broken down. A defining principle of Newtonian mechanics is that if one has complete information about any system one can always predict what will happen next with certainty. Newtonian determinism fails in respect of elementary rule-following: it seems that there are matters which influence the student’s response which are beyond the totality of inner and outer facts. A quantum physicist would feel entirely at home with Kripke’s (1982) way of expressing his interpretation of Wittgenstein’s philosophy: “If even God, who can see all the facts about the past (and into your mind), could not know that you meant addition then that doesn’t illustrate limitations on God’s knowledge. It shows that there is in this case no fact for him to know” (Ahmed, 2007, p. 102). Before continuing, it is important to realise that Wittgenstein does not deny that when solving mathematical problems one often has the sense that the relevant formula is “before one’s mind.” Rather, he’s pointing out that this formula before one’s mind can’t be the source of one’s ability to solve the problems – it’s merely a by-product of one’s instruction in addition. It will become clear in the paragraphs below that an introspected formula cannot fix how one solves problems requiring the use of the formula. Kripke (1982) is trying to explain how students follow the rule for the use of the ‘+’ sign given appropriate teaching and a finite number of illustrations of that rule. The idea that they are guided by a mental image of a rule proves unworkable. Could it be that one needs further evidence, namely, evidence that the student can interpret the rule correctly? It follows that there must be evidence in mind that the student has correctly interpreted the rule. However, this is of scant assistance, for the rule is capable of multiple interpretations. It seems, therefore, that one needs to have a rule in mind for selecting the correct interpretation. In order to explain the student’s ability to follow the rule for the use of the “+” sign, one must invoke a further rule – but this time the rule is in mind – for selecting the correct interpretation. One has now fallen into an infinite regress. An argument centred on the right interpretation will not work for the student must then have access to the rule for selecting this correct interpretation and one has a circular argument, because it is rule-following one is seeking to explain in the first place. It instructive to remind the reader of the central idea here. Facts are being sought about an individual which would determine in advance what response he or she should make to a novel problem which requires the use of a rule. It has been decided that no outer facts fix what the individual does next because any response can be shown to accord with the rule exemplified by a finite set of illustrative examples offered by way of instruction. The search then switched to facts about the individual’s mind. If God looked into the individual’s mind and spotted a representation of the “quus” rule identified earlier then, at first sight, it seems He could predict with certainty that if asked the question “68 + 57 = ?” the individual must answer “5.” The introduction of a finite entity in the mind (a mental representation of the formula) explaining the individual’s potentially infinite capacity for applying the rule is appealing until one notes that it is possible to have a formula in mind and yet not know how to apply it. It is clear that the formula in itself is neither sufficient nor necessary. It is “normatively inert” (McDowell, 1992, p. 42) because it cannot be used in isolation to pronounce the individual’s future response to the novel problem to be “125” or “5,” or any other number. As McDowell puts it, the formula just “stands there” in need of interpretation. McDowell (1992, p. 42) points out that attempting to locate the sought-after facts in the individual’s mind is fraught with problems because this is “a region of reality populated by items that, considered in themselves, just ‘stand there’.’’ Mental representations have to be interpreted. McDowell argues that whatever attaching the correct interpretation to the formula might consist in, it is nevertheless an element of a region of reality (the mind) populated by items that just stand there like sign posts. It follows that the interpretation itself has to be interpreted, and so on, in an infinite regress. Suppose I undergo some process of explanation – for instance, a substantial initial segment of some arithmetical series is written out for me – and as a result I come to have the right rule ‘in mind.’ How, when it comes to the crunch – at the nth place which lies beyond the demonstrated initial segment, and which I have previously never thought about – does having the rule ‘in mind’ help? Well, with such an example one tends to think of having the rule ‘in mind’ on the model of imagining a formula, or something of that sort. And so it is natural to respond by conceding that, strictly merely having the rule in mind is no help. For I can have a formula in mind without knowing what it means. So – the response continues – it is necessary in addition to interpret the rule. … An interpretation is of help to me, therefore, in my predicament at the nth place only if it is correct. … So how do I tell which interpretation is correct? Does that, for instance, call for a further rule – a rule for determining the correct interpretation of the original – and if so, why does it not raise the same difficulty again, thereby generating a regress? It may strike the reader that a criterion based on simplicity may distinguish understanding the “+” sign in terms of the addition rather the quaddition function. The quus function, with its differing approach for numbers less than 57, and those greater than or equal to 57, seems a particularly unwieldy function when compared with the simple plus function. Its mathematical symbolism would also be alien to any student in the primary phase of education. Could it be that the student simply selects a unique interpretation (the “correct” interpretation) from the infinity on offer by simply choosing the interpretation with the simplest associated function? Chaitin (2007) has extended Gödel’s incompleteness theorem (1931) and Turing’s halting problem (1950) to develop Algorithmic Information Theory. He demonstrates that the search for the simplest rule (or most “elegant” rule in Chaitin’s parlance) which generates a sequence of numbers is equivalent to the search for the shortest computer program which can generate the sequence. Unfortunately, Chaitin (2007, pp. 120-121) confirms that for any finite sequence of numbers, the identification of the simplest interpretation also presents intractable problems. Let’s say I have a particular calculation, a particular output, that I’m interested in, and that I have this nice, small computer program that calculates it, and think that it’s the smallest possible program, the most concise one that produces this output. Maybe a few friends of mine and I were trying to do it, and this was the best program that we came up with; nobody did any better. But how can you be sure? Well, the answer is that you can’t be sure. It turns out you can never be sure! You can never be sure that a computer program is what I like to call elegant, namely that it’s the most concise one that produces the output that it does. Never, ever! This paper details only some of Kripke’s (1982) attempts to escape the conclusion that if one restricts oneself to the totality of facts about the individual – outer facts about past practice and inner facts about mental contents (the two sets of facts treated as separately analysable) – one cannot predict the response the individual will make to the simple addition question: “68 + 57 = ?” Since all the facts are in keeping with an infinity of answers, one correct and the rest incorrect, Kripke (1982, p. 17) is compelled to conclude that, in providing a response to this question, the rule-follower must be characterised as making “an unjustified stab in the dark.” The student has no criterion for preferring 125 over 5; all the facts are in keeping with the correct answer and any incorrect answer. The student is in an indeterminate state with respect to an understanding of the “+” sign. So it seems that from a first-person perspective, individuals who have been taught to add using a finite number of examples, offer the first answer that comes into their heads when required to extend the addition rule to unseen computations. They have no criterion which guides their selection of 125 as the correct answer to the problem “68 + 57 = ?” There must be an error in the reasoning that produces such a counter-intuitive conclusion. According to the logic presented above a student who, having been taught to add via a series of examples and then instructed to “go on in the same way,” subsequently encounters the addition problem “68 + 57 = ?” and responds by writing “5,” can protest that he or she did go on in the same way; the student just didn’t go on in the same as the teacher who issued the instruction. There exists an interpretation which brings the answer “5” into accord with the teacher’s examples. Indeed, this is true of any answer the student offers. These two answers (125 and 5) and an infinity of other answers, are all in keeping with the totality of facts about the student. The student’s interaction with the sceptic shows that the student has no criterion which can be used to differentiate a correct from an incorrect response. The very concepts of right and wrong don’t seem to apply here. This invites the obvious question: In respect of the problem “68 + 57 = ?” what makes “125” the correct answer and “5” the wrong answer? What makes the teacher right in thinking the student should answer “125” and the student wrong in answering “5”? 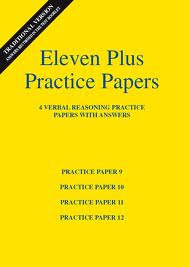 This issue is resolved by bringing in the human practice of mathematics. When we enter the picture, psychological measurement is bound to lose some of its Newtonian objectivity, an objectivity that quantum theory teaches is unattainable. Heisenberg (1958, pp. 55-56) stresses that the cost of the participant’s inclusion is reduced objectivity in scientific measurement: The “reference to ourselves” means that “our description is not completely objective.” Objectivity in the Newtonian sense is no longer the hallmark of science because it fails to account for the participative element of measurement. Beyond classical physics, measurement models with no place for human practices are of questionable scientific validity: “When we speak of the picture of nature in the exact science of our age, we do not mean a picture of nature so much as a picture of our relationships with nature. The old division of the world into objective processes in space and time and the mind in which these processes are mirrored … is no longer a suitable starting point for our understanding of modern science” (Heisenberg, 1962, pp. 28-29). Wittgenstein’s writings make clear that, divorced from human practices, the descriptors “right” and “wrong” lose their meaning, even in disciplines like mathematics and logic. Quantum theoretical “weak objectivity” (d’Espagnat, 1983) has replaced the strong objectivity of Newtonian mechanics because Newtonian objectivity misrepresents the psychometrician’s task. Wittgenstein (1975, p. 58) writes: “The only criterion for his multiplying 113 by 44 in a way analogous to the examples is his doing it in the way in which all of us, who have been trained in a certain way, would do it.” It follows that third-person ascriptions of the ability to add are based on the criteria afforded by the practice of mathematics, a practice into which the teacher has been enculturated. Wittgenstein notes that “Indefinitely many other ways of acting are possible: but we do not call them ‘following the rule’” (Malcolm, 1986, p. 155). Criteria hover somewhere between deductive and inductive grounds (Grayling, 1977) and their nature can be traced back to the introduction of the participating psychologist. For example, there is an intrinsic “vagueness,” to borrow Wittgenstein’s term, in the accepted number of particular additions one ought to compute correctly before having the ability to add ascribed to one. There is no fixed number of even numbers a student should write down before being regarded as someone who “understands” or “has mastered” or “has grasped the meaning of” the even numbers. This vagueness is a constitutive property of psychological predicates; it isn’t a shortcoming. Hence, third-person ascriptions of ability are based on criteria while first-person ascriptions are not; in the first-person case there are no criteria for attaching the correct interpretation to the mental image of a rule. In short, first-person and third-person ascriptions of ability are mutually exclusive; the former do not require criteria for an ascription of ability (the individual acts for no reason) but the latter do. First-person ascriptions of ability are associated with being right and wrong, while third-person ascriptions are associated with being right or wrong. Returning to the counterintuitive conclusion drawn by Kripke (1982), must it be accepted that individuals respond to novel addition problems by offering capricious answers? This conclusion needn’t be drawn because there’s an error in Kripke’s premise, namely, that his analysis treats inner facts (associated with first-person ascriptions of ability) as entirely independent of outer facts (associated with third-person ascriptions of ability). The idea that the inner stands in a deterministic relation to the outer has been challenged earlier. Wittgenstein considered first-person and third person ascriptions as forming an indivisible whole; they cannot be meaningfully separated (Malcolm, 1971, pp. 87-91). In summary when the measurement process is divided into the situation immediately before the individual responds to the question “68 + 57 = ?” (the individual’s ascription of ability to himself or herself) and the situation immediately afterwards (the ascription of ability to the individual by the measurer), the relation is not one of Newtonian determinism between two independent situations. Rather, it’s one of quantum complementarity where complementarity is the more general concept which replaced Newtonian causality. The difficulties identified by Kripke (1982) in respect of causality at the level of the individual can be seen in a new light by eschewing causality for complementarity. Polkinghorne (1996, p. 70) defines complementarity as a “combination of apparent opposites” and Whitaker (1996, p. 184) describes it as “mutual exclusion and joint completion.” In psychological predicates first-person ascriptions are made without criteria while third-person ascriptions require criteria. This is the mutual exclusiveness facet of complementarity in respect of psychological predicates. But these two very different ascriptions cannot be separated on pains of accepting Kripke’s conclusion that rule-following in mathematics is capricious. This is the joint completion facet. Ahmed, A. (2007). Saul Kripke. London: Continuum. Anscombe, G.E.M. (1985). Wittgenstein on rules and private language. Ethics, 95, 342-352. Barrett, P. (2008). The consequence of sustaining a pathology: Scientific stagnation – a commentary on the target article “Is psychometrics a pathological science” by Joel Michell. Measurement, 6, 78-83. Battig, W.F. (1978). Parsimony or psychology. Presidential Address, Rocky Mountain Psychological Association, Denvir, CO.
Bennett, M.R., & Hacker, P.M.S. (2003). Philosophical foundations of neuroscience. Oxford: Blackwell Publishing. Blinkhorn, S. (1997). Past imperfect, future conditional: Fifty years of test theory. British Journal of Mathematical and Statistical Psychology, 50(2), 175-186. Bloor, D. (1997). Wittgenstein: Rules and institutions. London: Routledge. Bohr, N. (1934/1987). The philosophical writings of Niels Bohr: Volume 1 – Atomic theory and the description of nature. Woodbridge: Ox Bow Press. Bohr, N. (1958/1987). The philosophical writings of Niels Bohr: Volume 2 – Essays 1933 – 1957 on atomic physics and human knowledge. Woodbridge: Ox Bow Press. 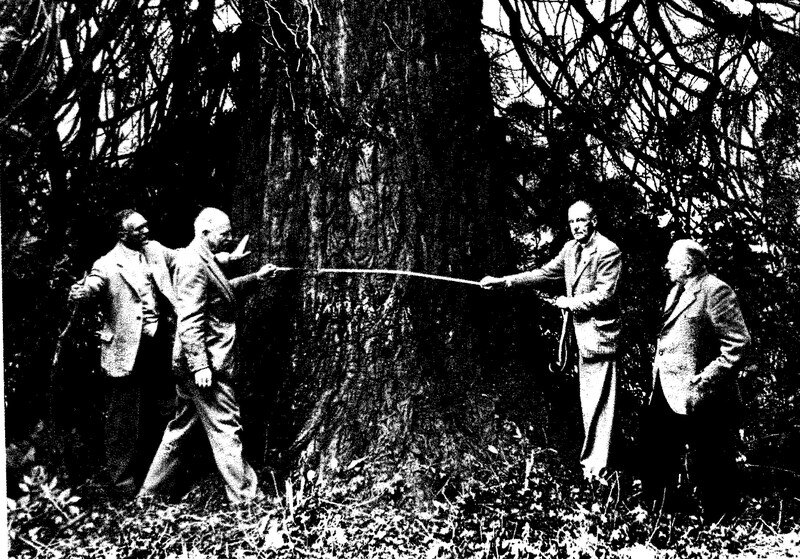 Borsboom, D., Mellenbergh, G.J., & van Heerden, J. (2003). The theoretical status of latent variables. Psychological Review, 110 (2), 203-219. Borsboom, D. (2005). Measuring the mind. Cambridge: Cambridge University Press. Bridgman, P. W. (1927). The logic of modern physics. New York: Macmillan. Bruner, J.S. (1990). Acts of meaning. Cambridge, MA: Harvard University Press. Byrne, B.M. (1989). A primer of LISREL. New York: Springer-Verlag. Chaitin, G.J. (2007). Thinking about Gödel and Turing. Hackensack, NJ: World Scientific. d’Espagnat, B. (1983). In search of reality. New York: Springer-Verlag. Elliot, C.D., Murray, D., & Pearson, L.S. (1978). The British ability scales. Windsor: National Foundation for Educational Research. Ellis, J.L., & Van den Wollenberg, A. L. (1993). Local homogeneity in latent trait models: A characterization of the homogeneous monotone IRT model. Psychometrika, 58, 417-429. Favrholdt, D. (Ed.). (1999). Niels Bohr collected works (Volume 10). Amsterdam: Elsevier Science B.V.
Feynman, R.P. (1985). QED: The strange theory of light and matter. Princeton, NJ: Princeton University Press. Finch, H.L. (1977). Wittgenstein – the later philosophy. Atlantic Highlands, NJ: Humanities Press. Gieser, S. (2005). The innermost kernel. Berlin: Springer-Verlag. Gödel, K. (1931). Über formal unentscheidbare Sätze der Principia Mathematica und verwandter Systeme I. Monatshefte für Mathematik und Physik, 38, 173-198. Goldstein, H., & Blinkhorn, S. (1997). Monitoring educational standards – an inappropriate model. Bulletin of the British Psychological Society, 30, 309-311. Hacker, P.M.S. (1997). Insight and illusion: Themes in the philosophy of Wittgenstein. Bristol: Thoemmes Press. Heisenberg, W. (1958). Physics and philosophy. New York: Prometheus Books. Heisenberg, W. (1962). The physicist’s conception of nature. London: The Scientific Book Guild. Hertz, H. (1956). The principles of mechanics presented in a new form. New York: Dover Publications Inc. Hood, S.B. (2008). Latent variable realism in psychometrics. Unpublished doctoral dissertation, Indiana University. Honner, J. (2002). The description of nature: Niels Bohr and the philosophy of quantum physics. Oxford: Clarendon Press. Jammer, M. (1974). The philosophy of quantum mechanics. New York: John Wiley & Sons. Jöreskog, K.G., & Sörbom, D. (1993). LISREL 8 user’s reference guide. Chicago: Scientific Software International. Kalckar, J. (Ed.). (1985). Niels Bohr collected works (Volume 6). Amsterdam: Elsevier Science B.V.
Kripke, S.A. (1982). Wittgenstein on rules and private language. Oxford: Blackwell. Luce, R.D. (1997). Several unresolved conceptual problems of mathematical psychology. Journal of Mathematical Psychology, 41, 79-87. Malcolm, N. (1971). Problems of mind. New York: Harper Torchbooks. Malcolm, N. (1986). Wittgenstein: Nothing is hidden. Oxford: Blackwell. McDowell, J. (1992). Meaning and intentionality in Wittgenstein’s later philosophy. In P.A. French, T.E. Uehling, & H.K. Wettstein (Eds. ), Midwest Studies in Philosophy Volume XVII: The Wittgenstein legacy (pp. 40-52). Notre Dame, Indiana: University of Notre Dame Press. McDowell, J. (1998). Mind, value and reality. Cambridge, MA: Harvard University Press. McGinn, C. (1984). Wittgenstein on meaning: Oxford: Blackwell. McGinn, M. (1997). Wittgenstein and the Philosophical Investigations. London: Routledge. Mermin, D. (1993). Lecture given at the British Association Annual Science Festival. London: British Association for the Advancement of Science. Michell, J. (1990). An introduction to the logic of psychological measurement. Hillsdale, NJ: Lawrence Erlbaum Associates, Inc.
Michell, J. (1997). Quantitative science and the definition of measurement in psychology. British Journal of Psychology, 88, 355-383. Michell, J. (1999). Measurement in psychology: A critical history of a methodological concept. New York: Cambridge University Press. Michell, J. (2000). Normal science, pathological science, and psychometrics. Theory & Psychology, 10(5), 639-667. Nagel, T. (1986). The view from nowhere. New York: Oxford University Press. Omnès, R. (1999a). Understanding quantum mechanics. Princeton, NJ: Princeton University Press. Omnès, R. (1999b). Quantum philosophy. Princeton, NJ: Princeton University Press. Oppenheimer, R. (1955, September 4). Analogy in science. Paper presented at the 63rd Annual Meeting of the American Psychological Association, San Francisco, CA. Panjvani, C. (2008). Rule-following, explanation-transcendence, and private language. Mind, 117, 303-328. Pears, D. (2006). Paradox and platitude in Wittgenstein’s philosophy. Oxford: Clarendon Press. Polkinghorne, J. (1996). Beyond science. Cambridge: Cambridge University Press. Polkinghorne, J. (2002). Quantum theory: A very short introduction. Oxford: Oxford University Press. Putnam, H. (1988). Representation and reality. Cambridge, MA: The MIT Press. Rasch, G. (1960). Probabilistic models for some intelligence and attainment tests. Copenhagen, Denmark: Paedagogiske Institut. Schroeder, S. (2006). Wittgenstein. Cambridge: Polity Press. Shimony, A. (1997). On mentality, quantum mechanics and the actualization of potentialities. In R. Penrose, The large, the small and the human mind (pp. 144-160). Cambridge: Cambridge University Press. Sobel, M.E. (1994). Causal inference in latent variable models. In A. von Eye & C.C. Clogg (Eds. ), Latent variable analysis (pp. 3-35). Thousand Oakes: Sage. Stapp, H.P. (1972). The Copenhagen interpretation. American Journal of Physics, 40, 1098-1116. Stapp, H.P. (1993). Mind, matter, and quantum mechanics. Berlin: Springr-Verlag. Stent, G.S. (1979). Does God play dice? The sciences, 19, 18-23. Stevens, S.S. (1946). On the theory of scales of measurement. Science, 103, 667-680. Suen, H.K. (1990). Principles of test theories. Hillsdale, NJ: Erlbaum. Suter, R. (1989). Interpreting Wittgenstein: A cloud of philosophy, a drop of grammar. Philadelphia: Temple University Press. Thorndike, R.L. (1982). Educational measurement: Theory and practice. In D. Spearritt (Ed. ), The improvement of measurement in education and psychology: Contributions of latent trait theory (pp. 3-13). Melbourne: Australian Council for Educational Research. Trendler, G. (2011). Measurement theory, psychology and the revolution that cannot happen. Theory and Psychology, 19(5), 579-599. Turing, A.M. (1950). Computing machinery and intelligence. Mind, 59, 433-460. Whitaker, A. (1996). Einstein, Bohr and the quantum dilemma. Cambridge: Cambridge University Press. Wick, D. (1995). The infamous boundary. New York: Copernicus. Williams, M. (1999). Wittgenstein, mind and meaning. London: Routledge. Willmott, A.S., & Fowles, D.E. (1974). The objective interpretation of test performance: The Rasch model applied. Windsor: National Foundation for Educational Research. Wittgenstein, L. (1953). Philosophical Investigations. G.E.M. Anscombe, & R. Rhees (Eds. ), G.E.M. Anscombe (Tr.). Oxford: Blackwell. Wittgenstein, L. (1975). Wittgenstein’s lectures on the foundations of mathematics: Cambridge 1939. Chicago: University of Chicago Press. Wittgenstein, L. (1980). Cambridge lectures (1930-1932). From the notes of John King and Desmond Lee, edited by Desmond Lee. Totowa, NJ: Rowman and Littlefield. Wittgenstein, L. (1983). Remarks on the foundations of mathematics. Cambridge, MA: MIT Press. Wright, C. (2001). Rails to infinity. Cambridge, MA: Harvard University Press. Special warning notice to parents considering these schools. Dualling schools are Victoria College, Wellington College, Campbell College, Lagan College (not a grammar school) St Patrick’s College, Downpatrick, and Antrim Grammar. In order for your child to gain admission to these schools it is likely that they must have taken BOTH the AQE and GL tests. Dualling schools use some non-transparent method to place your child in a band. Evidence has been obtained that a significant number of pupils will be misclassified. Can you really afford to take this risk? The Parental Alliance for Choice in Education wish to pass on their congratulations to all pupils who received results today from their efforts in taking transfer tests last November. Today is a time for celebration, recognition and relaxation. No doubt parents and family will be asked and may themselves be asking a multitude of questions about the next phase –“ will my mark or grade be sufficient to gain a place at a grammar school. There can be no immediate answer to that course of enquiry, it will only end when the admissions process is completed. Unfortunately every year since the Department of Education withdrew the transfer test, the Minister of Education and his misinformation campaigners have sought to sow seeds of doubt about the popularity of the system which filled the vacuum. Politicians and the media fan the flames by making unhelpful, ambiguous or ignorant statements and/or publishing opinion pieces about the tests. They also stray onto the curriculum, coaching or teaching to the test, and most egregiously pretend to support parents and pupils, all the while pushing the anti-selection, anti-grammar school line. 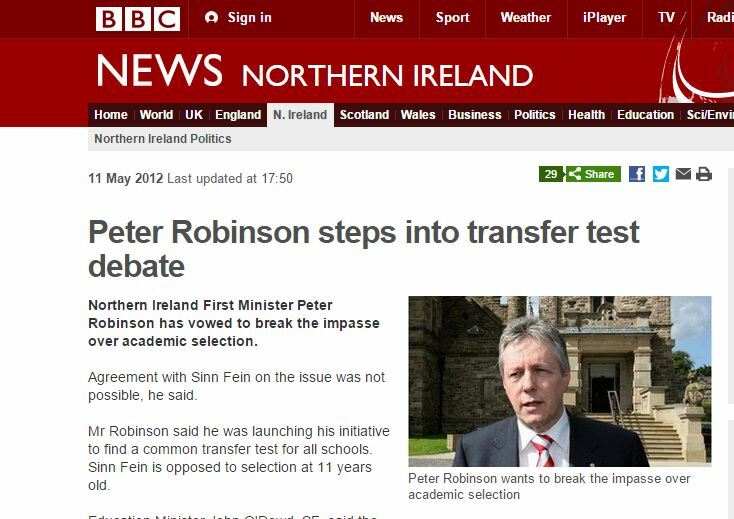 Take this example from the BBC in 2012 quoting First Minister of Northern Ireland, Peter Robinson of the Democratic Unionist Party. Another example is the mixed message editorial from the Belfast Telegraph in which Mike Gilson invites ridicule over the number of pupils taking the tests. But this move by the department is a nonsense in any case. Last year some 10,000 pupils took the unregulated AQE and GL Assessment tests despite opposition from Education Minister John O’Dowd. The shambles is that Belfast Telegraph readers are expected to believe a figure cited which is 4,500 lower than the combined record entry of 14,531. Where did Mike Gilson come up with this number? – The DENI? The BBC? The Detail? The Inspectorate? or is it simply a figment of his imagination? Parents and schools both appear to have confidence in the system. ….Yet Ms McIlveen (DUP MLA and Chair of Education Committee) is right- we need one test. No test would be better……Not only would one test spare those pupils who do opt to sit both assessments having to undertake five papers, it would create uniformity. It is time for those opposed to parental choice and academic selection by attainment testing to admit defeat in their ideological campaign. Like it or not, parental support has remained constant since Martin McGuinness’ Household Survey of 2002. There will be no acceptance of a comprehensive system in Northern Ireland and the wasted taxpayers’ money spend by anti-grammar school groups should be put back into traditional classrooms. 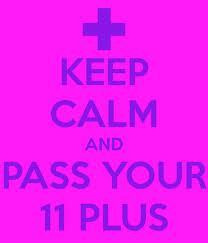 Well done to all those who received results today. There are no failures in trying. As parents prepare for the new school year many will be considering their choices for their children on transfer tests. For four years two very different tests have been available through the Association for Quality Education (AQE) and the Post Primary Transfer Consortium (PPTC). So which is the better test? It is remarkable that the question has not been the subject of research given the amount of column inches used by the Northern Ireland print media over the tests. One answer has been provided by Andreas Schleicher of OECD PISA, whose international rankings of countries education sysytems has resulted in policy changes. Good luck to all the pupils waiting for their transfer test results. The children and their parents/guardians are to be commended for their efforts. The children, not least, for being willing to have their numeracy and literacy skills tested and excerising their right to compete for a place in a grammar school. The parents/guardians for supporting the efforts of those schools determined to deliver the equality of opportunity that a transfer test affords. 2013 is the forth year that the “unregulated” tests have been organised and delivered to the highest of standards and it is testament to those who have resisted the determination of an Education Minister hellbound on removing parental choice for a grammar school education to match the needs of their children. It is important when the results are known not to fall into the annual trap generated by opponents of selection by stressing over the marks or grades (these always remove information and should not ever be compared to the old CCEA grading system) obtained by the pupil. Expect and resist the rumour mill but instead arm yourself with the knowledge that until the admissions process is completed no one can issue a guarantee of a place at any grammar school. The marks/grades from previous years may give a reasonable indication of a school’s 2013 intake but do not be put off in listing a preference because of something someone has told you “on good authority” or “inside information”. Remember that Open Enrolment has resulted in about 42% of post-primary pupils getting a place in a grammar school. In making a selection of preferences it is important to take into consideration future plans for the schools. There is little benefit in choosing a school which in a short period will no longer be a grammar school. The school is unlikely to inform you of their change in direction, after all they are competing for your child and relying on their marketing efforts. Your child will not benefit in the long run. Forty plus years of research evidence and data on attainment shows that mixed ability schools generally produce lower attainments at GCSE and A-Level. Add to that the negative impact of the revised curriculum and the entitlement framework and the Education Minister's insistence in breaking parity on examinations with England and this year's cohort of parents making vital decisions on behalf of their children must be sure of their choices. 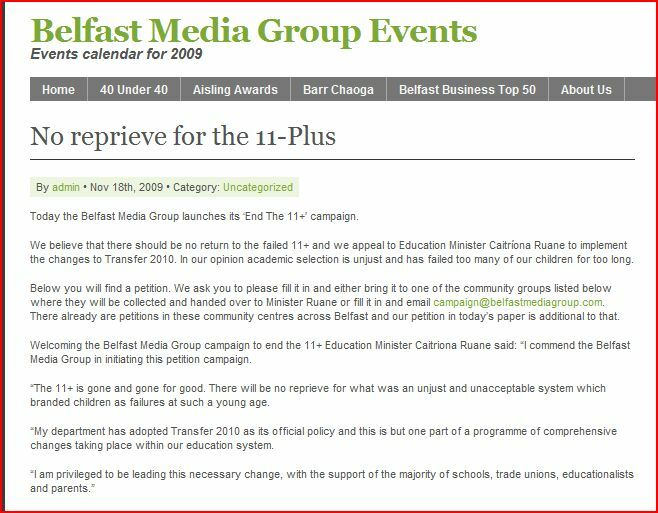 On Wednesday 21st November, 2012 the Belfast Newsletter published an Opinion article http://www.newsletter.co.uk/community/your-view/policy-will-end-grammar-schools-1-4505902 by PACE highlighting attempts by the two major unionist parties to hand control of unregulated 11-plus testing back into the hands of an anti-choice Sinn Fein Education Minister. Visit the Newsletter site – then make your pro-selection views known via the comments section. 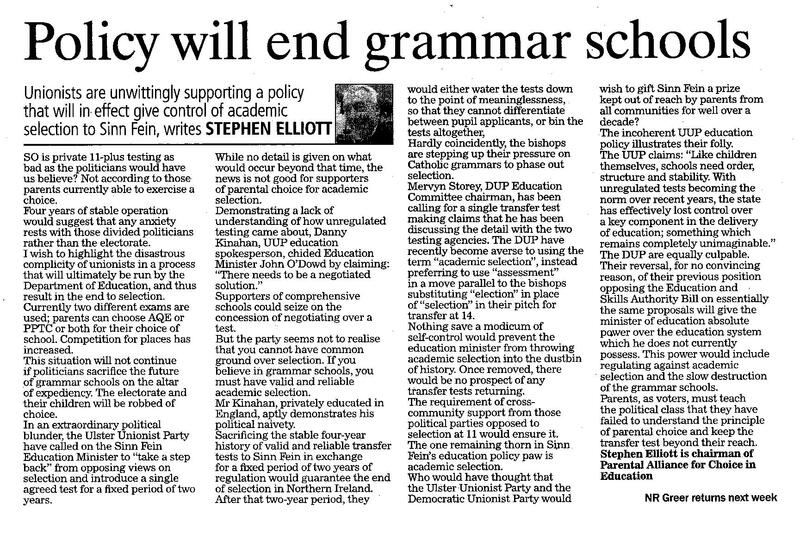 The Belfast Telegraph’s campaign to end academic selection. Only towards the end of the Belfast Telegraph “Sit Down – Sort it Out” did they reveal their default anti-academic selection position . There can be no doubt that readers convinced otherwise by previous Belfast Telegraph campaigns reflecting popular views on selection have been misled. Sinn Fein John O’Dowd’s refusal to participate may have given the impression that his objection was based on the Belfast Telegraph’s support for a choice of academic selection. The Belfast Telegraph made no such commitment. The rival Belfast Media Group proved that impression false. Bishop Donal McKeown has made it unequivocal on where the church hierarchy stands and it is clearly now actively opposed to the views of Catholic parents who support the right for a choice. This revelation from a body, none of whom are parents, puts paid to notion of choice and reveals the deliberate sectarian position adopted by the Catholic authorities. Why then did they support their Boards of Governors in providing a GL Assessment test to determine entry to their grammar schools? 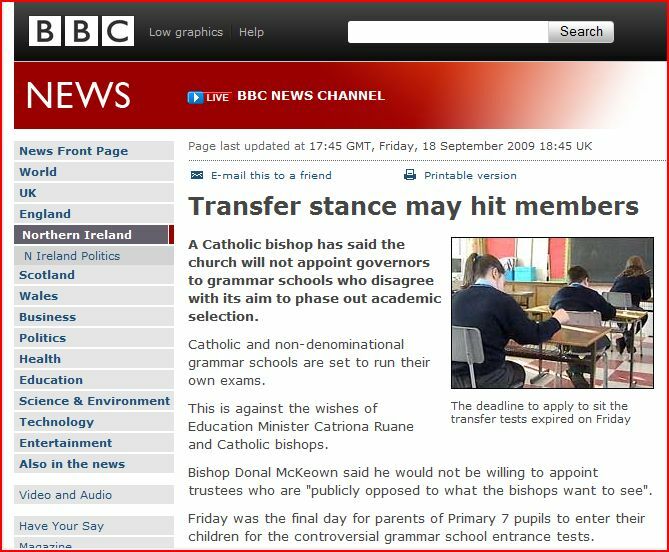 Once parents have been croziered into compliance with the “Catholic Test” it will be withdrawn leaving the parents and pupils adrift. For Catholic parents throughout the UK the realisation that the Catholic church place corporate and financial interests before those of parents and children will be hard to accept. The facts hurt.